Check other entries here and in my other blog. Ping-balik: Weekly Photo Challenge: The Sign Says (Sign Revisited) | What's (in) the picture? Ping-balik: Weekly Photo Challenge: The Sign Says (Puerto de las Palomas) | What's (in) the picture? Ping-balik: Weekly Photo Challenge: The Sign Says (What happened to faith?) | What's (in) the picture? Ping-balik: Weekly Photo Challenge: The Signs Say (My Name! Well, almost) | What's (in) the picture? Ping-balik: Weekly Photo Challenge: The Sign Says (bicycles go where?) | What's (in) the picture? 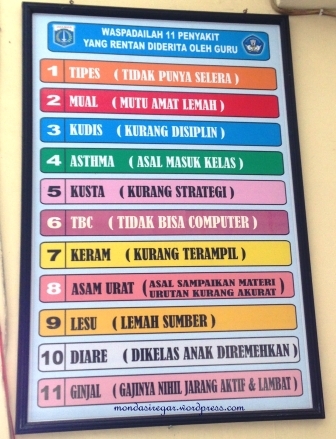 eyampun.. ini dapet disekolah kakak atau adek..? bagus juga nih.. peringatan tajam langsung buat para guru.